wow I can't keep up with the posts! No time to read Christopher's, I'm late for work! And you proposal would also create a contradiction regarding a principle that appears to be used in all hand reading systems: the 2nd phalange of the thumb gets associated with 'thought' (thinking)... which can only be described to represent the inner world. The lower phalange of the thumb was never associated with 'thought' or 'thinking' in the Elemental Cheirological system, so your assumption here Martijn is entirely incorrect. As already mentioned, in elemental cheirology, the thumb was associated with Ether; and there is a vast difference between Air and Ether. As previously mentioned, it was Benham who put 'thought' on the lower phalange of the thumb with no apparent greater justification than the idea of impulse control. Except he did not put 'thought' on the thumb, he put Reason - which is an altogether different thing. Very nice to see you joining this discussion! "The upper phalange (where the nial is) rules personal determination, the lower phalange rules deductive reasoning ability." "These "worlds" (the inner and outer) are represented by the two hands themselves (passive and active)." These words suggest that in the elemental system the 'outer world' is associated with the active hand (and the 'inner world' with the passive hand). "The Thumb - This is a very important digit, for as a whole it shows both the mundane and physical nature and quality of the subject's personal energy. (The upper phalange (where the nial is) rules personal determination, the lower phalange rules deductive reasoning ability.)" So, it appears to me that that in the elemental system the 'outer' versus 'inner' dimension was originally associated with in respective the 'active' and the 'passive' hand; however the nature of the principle(s) associated with 2nd thumb phalnge can directly be associated with the 'inner world' (= what happens inside us, including: thoughts, fantasies, dreams, and emotions that spontaneously come into consciousness or that we intentionally focus on). Sorry Christopher, I think Dukes' definition (+ the descriptions shared by Fincham & Hirsch) is quite similar to the definition of the thumb in my picture(s). But maybe you are willing to specify your thoughts on this in response to the my observations above? For this reason I have tried to create a value-free map of the hand (see picture above), describing the role of the thumb in the perspective of the full hand - without using any theological- nor any philosophical vocabulary. with all due respect Martijn, you have not managed to create a value-free map of the hand.... Words like 'identity', 'ego', 'self' are not value-free and all have specific philosophical indications and/or ontological assumptions. You have just let Kant and Plato in again by the back door. The problem with such an inherent transcendentalist approach is that it necessarily presumes there would be a 'one-thing' that is the most important part of the hand; or a 'one-thing' that is the essence of a person. However, such transcendentalism overlooks the self-evident fact that hands change. Souls, by their nature, cannot. .To touch on the allocation of the element Ether as it was applied to the thumb in Elemental Cheirology, Ether was seen as the element of integration. So the strength of the thumb was a measure of how you were able to express the characteristics seen in other parts of the hand. Taking the strength of the thumb as an indication of the control or influence you have over the world around you, so the thumb side of the hand was considered as the ‘external’ side of the hand. Apes have small thumbs and little control over their environments; humans have stronger thumbs and an oppositional grasp which allows them to manipulate and influence the world. The ‘value free’ terms you have applied to the thumb (feeling, thought, will) are of course also not ‘value free’. There is, for example, no such concept of ‘will’ in the Buddhist Abhidharma where the nature and contents of consciousness is discussed at great length. So, again, if you are going to use these terms you need to say where they came from and what they mean…. For my part, my rusty memory says that the first person to label the thumb in this way was William Benham - and I think he used Desire, Reason and Will. Apologies if I have got this wrong, its been more that 15yrs since I read that book. However, he did make a great deal of the relative strength of the two thumb phalanges as being the balance between Reason and Will in the sense that it showed whether you were impulsive or more self-controlled. So, I am disappointed that you have chosen to follow nineteenth century morality as the ‘value-free’ values you are imposing on the thumb. Of course, you may have got these from that well-known moron Edo Sprong whose written works are just extensive unthinking plagiarisms of earlier generations of idiots. Why you should quote him or refer to him at all is beyond me. However, it does not surprise me that you refer to PDC; after all, Holtzman is just another transcendentalist. And that insight is in itself enough to show why so many of his ideas are just so wrong. Christopher, I must inform you that some of your comments above indicate to me that you might have misunderstood my intend with this discussion (+ the maps that I have presented). In short: the maps do not represent my personal view, because in this discussion I have only tried to present a map which summarizes the most common similarties that are seen in the most well-known hand reading systems around the world. "Taking the strength of the thumb as an indication of the control or influence you have over the world around you, so the thumb side of the hand was considered as the ‘external’ side of the hand." ... Christopher, do these words represent your current view? "Christopher stated numerous times that he no longer supported ether as relating to the thumb or any other part of the hand for that matter, unless maybe the middle of the palm." PS. I only refered to Holtzman because he present a view that represents the opposite of some of the principles that I have presented in my maps (e.g. Holtzman associates the thumb with the external world and the pinky side with the inner world... he uses for the 2nd thumb phalange the concept of 'counterwill' that has been described by Otto Rank, a collegue of Freud; but I feel that Holtzman's vocabulary is hard to understand because he describes everything from a psychoanalytic perspective... however, I believe that the description of 'counter-will' can recognized to show similarities with descriptions of 'thinking', so Holtzman's approach regarding the 2nd thumb phalange does not differ very much from the traditional perspective in the field of hand reading). Another example of dividing the hand. Thanks very much for sharing this also. Lynn, I hope you noticed that the words 'surrounding world' associated with mars-positive in this map. Martijn (admin) wrote: So, at the end... maybe what is missing in our discussion so far is a proper analysis of why the palm became associated with the 'body' and the fingers with the 'mind'...?? Because at first sight it would make much more sense to simply assume that the (mental) 'mind' SHOULD require to relate to our 'inner world' only... and not to the outer world! Correct??? Fingers predominate = Long fingers (air and water hands) the mind predominates over the body. ie mental activities are most important, inner world is more dominant over the physical, active world. .
Palm predominates = Short fingers (earth and fire hands) the body predominates over the mind. 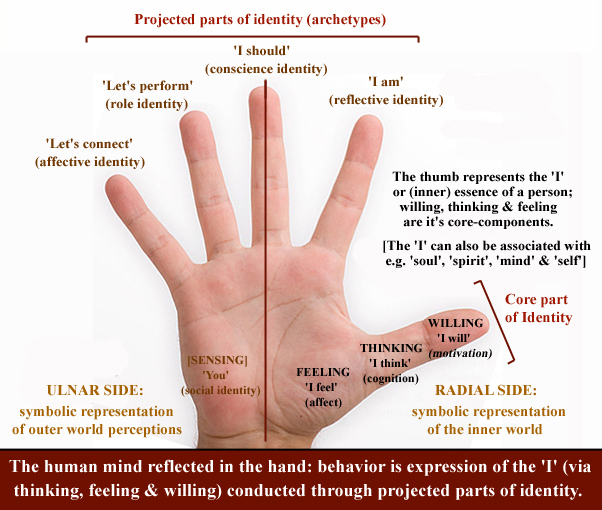 (ie physical activities ‘doing’ predominates over ‘thinking’)"
However, if fingers & thumb would get associated with 'outer world'... this would create a contradiction with the idea that the fingers represent the 'mind'. I suggested " the palm represents the inner world and .the fingers & thumb represent how we connect that to the outer world." not the outer world itself. A vehicle to connect with the outer world. Thanks for you attempt Lynn, but I still don't understand your reasoning... because it appears that you make two assumptions without considering the fundamental problem that results from both assumptions TOGETHER! "the palm represents the inner world and the fingers & thumb represent how we connect that to the outer world". "palm vs fingers - the fingers represent the mind, the palm represents the body. They reflect the general mind/body balance of a person." This last principle implicates that you associate long finger with more influence of the 'mind' (over the 'body'). However, by principle... I think there is no way to avoid (or ignore) the fundamental association between 'mind' and our 'inner world'! And therefore, if you assume that only the palm represents the inner world (and the fingers represent how we connect the inner world with outer world)... then it would not no longer make sense to also assume that the fingers represent the 'mind'. Because the result would become that both the 'palm' (= inner world in your first assumption) and the 'fingers' (= 'mind' in your second assumption = inner world [by principle]) are being described as representing the inner world. Looks like a clear (fundamental) philosphical inconsistency to me, don't you think?. I hope this now make sense for you as well? I have run out of suggestions. I think I've reached the end of my headline. Martijn, Have you changed your reason for presenting this discussion? I'd be happy to, if that is okay with Christopher, the originator of the topic and with Lynn the admin of the board. No, I have not changed my reason for presenting this discussion. I wonder: what is your perception regarding my reason to present this discussion? Has your perception changed during this discussion? Patti is aware that I am wary of publically quoting from the cybercafe as it was a private group. But of course there is no problem if the author consents. Sure Martijn, it appeared that you originally presented this topic and your graphic with the idea of supporting your findings regarding introversion and extroversion and hand features, in particular the thumb. You initiated your theory with the suggestion that this could be presented without using words that related to philosophical viewpoints. Christopher gave permission in email and Lynn is giving her okay here. I'll copy and paste the comment shortly. Different handreaders see the different sides of the hand in different ways. Some see the radial (thumb) side as being 'outer' whilst others see it as being 'inner'; equally, some see the ulnar (little finger) side of the hand as being 'inner' whilst others see it as being 'outer'. Does this matter? Is this just different 'ways of looking'? Well, I believe it does matter. How you look at things determines how you see things. In our case, how you look at a feature of the hand will determine how you attempt to interpret it. There are probably good arguments for both points of view. However, as I see the thumb side as the 'outer' half of the hand and the little finger side as the 'inner' half of the hand, I can only present a coherent argument for this point of view. If someone has a good argument for the other way of looking at this, I would love to hear it! I see the radial side of the hand as being 'outer' or, more precisely, outwardly directed, quite simply because on this side of the hand , we find the thumb and the index finger, the two most important digits with which we manipulate the world around us. As useful as a little finger is, I would rather lose this digit than my thumb! It is the thumb and index finger which we use to do things in the world, much more than the other digits. We use these two digits in more of our everyday hand gestures too - pointing, hitch-hiking, the 'OK' sign etc. they are more communicative with other people than the other digits are. (Now, I know that some of you are going to say: "but the index finger is ruled by water, which is an internal element"... in which case you get my reply: "Aha! so another argument for considering the index finger as being ruled by the fire element then!!"). In terms of the lines, I see the start of the Air and the start of the Earth lines as being where you 'take in' things from the external world - food in the case of the Earth line, ideas in the case of the Air line (I am thinking less and less that the Air line shows how you communicate, but more how you 'digest' ideas and information from external sources). By contrast, the Water line I see as expressing one's inner feelings and sentiments, running towards the external, ie towards the radial side of the hand. With Spier, I agree that the Fire and Air digits reveal more about the personal (ie emotional/ sexual and therefore intimate) aspects of one's life. In other words, things which are more 'inner' than 'outer'. And I see the Saturn line as being the lineal divider of the hand, dividing the 'inner half' (ulnar) from the 'outer half' (radial). Hence, all other secondary lines are 'inner lines', revealing more internalised psychological processes than the main lines of the hand. the main lines of the hand show how these act out in your life; for instance, the Neptune line shows dreams and fantasies, the Water line shows how these are acted out and expressed. 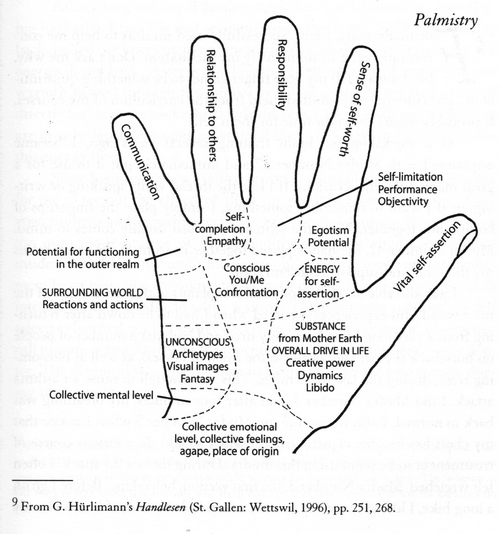 Charlotte Wolff (and others) saw the hand in this manner as well, seeing the radial side of the hand as 'conscious' and the ulnar side as 'unconscious', borrowing from the Freudian framework (she also had a central section of the hand, around the Saturn line, which she termed the area of superego). I am just running various ideas off the top of my head. Anybody else got any others? I am sure there are more! And anyone want to create a list of reasons/justifications for the Academie Anthropodynamica's point of view? The element Ether. Its got to go. Especially, it has got to go from the thumb. What has Ether got to do with the thumb anyway? PS. I'll wait for Christopher to share his current view regarding these quotations from the old Hand Reading Cyber Cafe (I don't remind his comments, but in the perspective of our current discussion... Christopher's words from those days are certainly amusing for a read! ). "The correlation of the thumb with Venus goes back to mediaeval times and modern palmists have followed suit ever since the C19th revival of interest in palmistry. I totally agree that Venus is a completely inappropriate association for the thumb - and, to a great extent, to the ball of the thumb as well. How the thumb came to be associated with 'logic', reasoning' and 'evaluation' is not so clear to me - though I think this may stem from William Benham (from whom everyone else took their lead as well..) I was never happy with those associations, even from when I first read Benham's book back in 1983. However, like most things, one goes along with it at first as one has nothing else to go on. But after so many years, you drop such interpretations: you either have found that they don't work or that they are irrelevant to an practical assessment of the hand. However, since most thumbs are average length, average set, average width and average length, I rarely consider these factors. You need to know what they are in order to identify an 'abnormality', but things like low-set thumbs or long thumbs I have found to be the exception rather than the norm. In other words, for practical purposes, the thumb has more to do with how the person imposes themselves on the world around them, how strong a character they are. 'Will' then seems an appropriate association to make for the thumb - even if we could debate till kingdom come about what 'will' is!! But I am less convinced than ever that it has anything to do with logic, reasoning and evaluation. I think those ideas should be consigned to the dustbin." this is what I used to say about the Ether element (an extract from 'The Beginners Guide to the Hand') I re-itterate that I no longer hold these views! In particular, the idea of anything being 'transcendent'. Emptiness, of course, is not a transcendentalism at all. As a principle of integration/synthesis, I see no problem but I don't associate that with being anything necessarily 'spiritual'. Ordinary life is quite mystical enough for me these days. "However, Ether is the most refined element of all. It does not manifest in the world as the other four elements do. There are many synonyms for ether in various cultures, ch'i, prana, the breath of life, life force, energy, God, Allah, Tao, Brahman, Spiritus Sanctus etc. Ether is thus the transcendental or spiritual element. The other elements can be seen as the various manifestations of ether as they are really but different vibrations of the ether element. Ether is the whole of which the other elements are a part. A good analogy for ether is white light. White light refracts into seven colours, its constituent frequencies. We cannot see white light, we can only see the colours; but if it wasn't for the white light there would be no colours at all! Light has not been changed, merely separated into its component parts. Such also is the relationship between ether and the four manifest elements. The ability to fully articulate the nature of ether is impossible, as it is beyond our intellectual comprehension: "The Tao that can be spoken is not the eternal Tao". ... Ether represents the principal of integration, at the highest level, a spiritual union with 'God' or the energy of the universe." Just to add my 2 cents worth here regarding will and logic. My short and sweet definition is the top relates to will in this sense - "Do it because I said so!" and the lower section relates to logic/reason in this sense - "Let me explain why you should do it my way." Variations in the thumb shows which dominates and how these approaches are used. Patti wrote: Just to add my 2 cents worth here regarding will and logic. My short and sweet definition is the top relates to will in this sense - "Do it because I said so!" and the lower section relates to logic/reason in this sense - "Let me explain why you should do it my way." At first sight one could point out that your key-words 'will' (1st thumb phalange) and 'logic/reason' (2nd thumb phalange) both refer to conscious cognitive processes; and both are recognized to belong to the primary human psychological functions (which are part of the inner world as those functions are inside of us). Your earlier feedback indicates that you consider each associated with both the inner world and the outer world. I understand the part related to the inner world... but how do you explain the part relating to the outer world? PS. Finally, after studying & discussing these details, I would like to inform you that I now perceive that the key-principles of the elemental system do not violate the principles that I have described in my second picture. I can now only hope that I have explained & argumented the fundamentals of my observation properly. So regarding this picture, I still cannot equate ulna side of the palm with outer world, nor radial with inner. How can you associate luna mount - imagination, intuition, creativity - with 'outer'? I have thought quite a bit more about this (excellent) question.of yours... as I feel that my first answer was rather abstract (and probably far too technical to become useful as a step ahead in this discussion). However, after studying- and reading quite a bit more how these functions (imagination, intuition, creativity) are beiging described at wikipedia... I have to conclude that the words 'imagination' & 'intuition' can best be described to relate directly to the inner world. However, regarding the word 'creativity'... one can argue that 'creativity' includes a variety of aspects. Wikipedia describes these as the 4 Ps: process, product, person and place. Interestingly, the words 'product' and 'place' suggest that a large part of creativity relates to the outer world. So, we are here confronted with... that we should try to be aware that not all aspect of the 'luna mount' are associated with the inner world, nor the outer world. 1 - One can make a list of the most common used keywords (preferably found in various systems of hand reading) that are associated with every zone/mount of the hand, in order then to evaluate for each of the key-words whether it relates to the innner world or the outer world. 2 - Another approach would be to look at the classic lines that are found in each zone/mount of the hand, in order to execute a likewise procedure as described in point 1. - 2a) I could point out that in line with my earlier example relating the pinky finger with communication & relationships... the palmar zone below the pinky is usually featured with one of more affection lines (marriage lines); marriage/relationships of course directly relate to the outer world. -2b) However, regarding the mount of moon we have a variety of secondary lines: the intuition line (inner world), the via lascivia (probably relating to the outer world because of the addictive/sensual character), travel lines (outer world). - 2c) And for the index finger (jupiter): Ring of Solomon (associated with 'wisdom' which relates to the inner world). Lynn, how does this approach look to you so far? Also if I may mention that the passion of Venus is responsible for the towering force which gives impetus to the Final success shown by the thumb. This is whether we believe that Venus is a part of thumb, or not. Argumentatively, it may or may not be. I could for either; as long as we know how what influences which. There was a time when Pluto was considered a planet; another time it was not. But Pluto did not change. It being downgraded/upgraded was with the viewer. I was a fan of Freud from my younger days; from age 16 to 18 onwards; still am. I instinctively felt that he was talking sense; despite some claims that he made up some case histories himself to support his understanding better. If that is true, then he knew 'marketing' well, even at that time. Hi Martijn, I too have the same set of qtns from my side as Lynn has asked. Here are some thots from my side. The discussion here is about the division of the palm. The method you're trying to use, as described above, is to identify the division using the lines, which represent the manifestation of the energy in the underlying mount. As already mentioned here, the palm as a whole represents all that is inside of us. The division indicates whether we are conscious of that energy or not. However, irrespective of whether I am conscious or not, the energy seeks an outlet to get expressed in my life and/ or in the world. Then, how can this be used ( the expression of energy in the life and/or in the world) for the division of the palm? Take the ex. of intuition line, which you're quoting for inner world energy. But, intuition is something which one gets for the outer world, the ppl/events in the outer life. If we think like this then the line of intuition goes to outer world. Similarly, the case with the line of marriage. Yes, a marriage is an event in one's life which everyone would be aware of. But, the marriage partner is someone with whom one shares all the personal stuff(physical, mental, emotional), which one is not comfortable sharing with everyone he/she comes across in the life. It is the bonding, the comfortness/trust/openness in the relation that matters. Effectively, what I am trying to convey is we can't use the expression of energy in the outside world/life for identifying the division of the palm, as it would anyhow get expressed. hi Rishi, many thanks for your reply. I was also thinking about start of heartline on ulna side, confirming that our emotions start in the inner person (ulna) . But since then I was thinking about start of headline being on radial side (which I associate with 'outer') yet I could apply my own arguments with regard to the start of the headline - don't thoughts originate in the 'inner person'. But of course! thoughts certainly do 'originate' in the 'inner ' person; no doubt about this! Thank you for explaining the terminology. (ulna & radial)! & I searched google to find the original meanings (not in terms of palmistry)! Ulna refers to 'inner'; while radial refers to going towards the radius. In astrology discussions, in the forum that I am the moderator of, & also studies/research of mine, whenever I find a words like the ones you've introduced me to; I always make it a point of checking google to find the true/original meaning/sense. Kiran.Katawa wrote: Hi Martijn, I too have the same set of qtns from my side as Lynn has asked. Here are some thots from my side. Well Kiran, I understand your examples as an attempt to describe how one can create arguments regarding how (possibly) any line can be associated with both the inner- and outer world. And I recognize that this is actually a very common practice in the fields of hand reading. However... the various models discussed in this topic show that such a 'loose' aproach leads to models that not only contradict each other... because when looking at the fundamentals inside a model one can also find contradictions. (E.g. even in Patti's quote from Christopher Jones' words we can see Christopher describing an inconsistency regading the index finger and the element 'water'... which he simply answered with a rethoric that one can use the problem to argume that the index finger should be associated with the element 'fire'. I can hardly call that a solid approach to deal with such inconsistencies). This discussion also illustrates that an assocative/eclectic approach (without a proper study of the fundamentals) can easily lead to contradications... of which one may not be aware of! For this reason I think it is really necessary to focus on the (objective) fundamentals... and to avoid the making of (subjective) associations - which could easily turn out to become a swamp when a proper analysis of whether the associations are justified is missing. Sorry Kiran, I think you have managed to share a few of your associations... but I observe that a proper analysis of your arguments is missing (for example: you confirmed that relationships are taking place in the outer world, however, then you did not recognize how your concept of 'sharing personal stuff'... is actually an activity that relates to the outer world as well - and therefore I hope that you can understand that I reject your argument because of this fundamental misperception). While reading your first para, I felt that you understood what I was trying to describe. But, at the end, you mis-read me or left out some points . The examples I gave was to show: "how one can create arguments regarding how (possibly) any line can be associated with both the inner- and outer world." What is your view on: As already mentioned here, the palm as a whole represents all that is inside of us. The division indicates whether we are conscious of that energy or not. However, irrespective of whether I am conscious or not, the energy seeks an outlet to get expressed in my life and/ or in the world. Then, how can this be used ( the expression of energy in the life and/or in the world) for the division of the palm? Interesting posts today from everyone.